Like the world needs another 7" Android tablet. Well, maybe it does. Or (more likely), it doesn't. No matter where you stand, the Kindle Fire couldn't be less relevant to this debate. It isn't just another Android tablet. It's a hardware Amazon account, 7 inches tall by 5 inches wide. If tablets are for fun and laptops are for work, the Kindle Fire is for shopping. If you put Amazon and the Kindle Fire in a multiple choice question, the answer won't be A) Because everyone else is doing it. It's more like B) We need to do for music, videos, apps and games what Kindle does for books. Simple as that. The Kindle Fire isn't about versatility in an ultra-portable form factor. Some tablets are. The Fire isn't desperate to unsettle Apple's iPad. Some Android tablets are. We'll say it again. The Kindle Fire isn't your average Android tablet. In a way, it isn't your tablet. Well, yes, it's yours to have but the content to enjoy on it is Amazon's to sell. The Kindle Fire is not an e-reader. It's a multimedia device with web browsing and email - and that's a lot more than an e-book reader. Yet, the backlit LCD screen is obviously no match for e-ink. 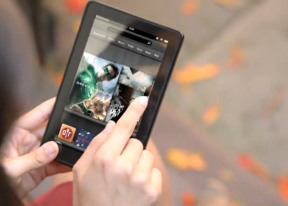 The Kindle Fire is touted as a reading device - as much as it's for Internet browsing, listening and watching. If it's mags and comics, we'd agree. For e-books, any other Kindle would do a much better job. The Fire is actually for users who have a Kindle already. It's an addition - not a replacement - to any generation of Amazon's e-ink devices. An older-gen Kindle e-reader and a Fire combined cost less than most tablets out there. The Kindle is so cheap because it lacks many basic features. The sub-200 dollar price tag is meant to encourage Amazon subscribers to keep on shopping for music, video, apps and games as they've been for books on their Kindle readers. On the other hand, the shocking lack of features (in what's technically an Android tablet) is meant to discourage bargain-hunters who have no intention of ever buying Amazon's content. The Kindle Fire is not competing with Samsung, LG or any other maker of Android tablets. Amazon's profit is not in the hardware they ship, they sell digital content. Amazon is not racing with Apple's iPads and iPod Touch. They're after Apple's iTunes. We know this doesn't make the Kindle Fire's limitations more palatable. But maybe it helps have the right kind of expectations about the device. The Fire is a nice and easy gadget, which is meant to bring a huge catalog of digital content a click away. Not the dirty cheap tablet some may have been hoping for.